Bring in the New Year without Bringing those Bed Bugs with you! Let 2018 be the year of no more bed bugs! If you have had bed bugs for a short time or a long time, it doesn't matter. At Ampulex we have flat-rate pricing, guarantee results, and offer financing if needed. Give us a call at (513)550-5352 for a Fast & Free Pest Quote or to schedule a Free local Bed Bug Inspection. Bring it the New Year without bringing those Bed Bugs with you! Bed bugs can be both stressful and expensive to deal with. Lucky for you, Ampulex offers affordable pest services that will put your mind at ease. Our technicians are highly skilled, friendly, discreet, and most importantly they are efficient. If you are certain that you have a bed bug infestation, it is in your best interest to do some prep work before our technicians treat your home. This prep work includes removal of all items in bedside tables, and placing said items in a secure and sealed plastic container. Removal of all clothes and bed sheets around the impacted area, and placing items in black garbage bags that can be tied shut. Most importantly you should refrain from moving ANY furniture or items from the impacted room as it could further spread your infestation. How to Avoid bringing Bedbugs home when Traveling! Tired of Bedbugs Hitchhiking a ride to your home?!?! Bedbug Infestations can occur anywhere and anytime, but the risk becomes higher during peak travel times. One thing we've found about bedbugs is they do not discriminate when traveling. From first class to coach or 5 star hotels to a little motel they can be found hiding and waiting to come home with you. This is why we'd like to share some tips on avoiding bringing these little hitchhikers home when traveling. First when entering your hotel room keep your luggage off the floor or bed. It's best to place luggage in the bathtub or on top of a table and then inspect the room. It's a good idea to do a quick scan of the headboard and inspect seams of the mattress under the sheets. If you see any dark stains on the mattress, light brown shells, or pearly white eggs notify the staff right away. Bed bugs often can be found at the baseboards under the head of the bed. If you do find a questionable bug save it in a baggie or container until it can be properly identified. It is important to know what bed bugs look like. You can see many images of bedbugs, shells, and skin casings on our website www.AmpulexPestControl.com. Adult bedbugs are reddish-brown and about a quarter-inch in length. 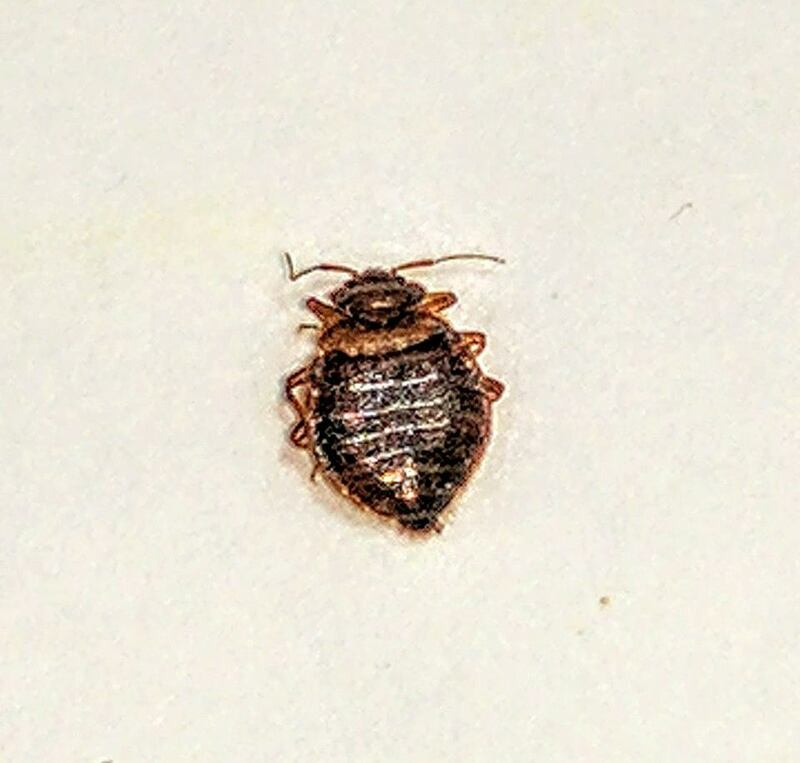 Adolescent bedbugs are smaller and often have a lighter brown color. One of the most important step when dealing with bed bugs is reducing clutter. Bedbugs love to hide, so clutter just makes that easy for them to do so. Bed bugs also hate high heat, so when returning home from a trip it is best to launder all clothing and linens in hot water and dry on highest heat for at least 30 minutes. If it's a hot summer day you can leave luggage in the car for a few days in case any tried to hitchhike a ride home with you. Even when taking these precautions unfortunately sometimes bed bugs still make it home with you. Don't panic! You don't want to deal with bed bugs without a professional. Ampulex offers affordable bed bug control with a minimum 90 day warranty. Check our reviews to hear from our customers. Call (513)550-5352 for fast and free quote!